In the study, NU researchers employed the fruit fly model of Huntington’s disease, a well-studied model organism for both circadian rhythms and neurodegenerative diseases. The researchers knocked down the hop gene in fruit flies with the protein that causes Huntington’s disease, and were surprised to find that knocking down the gene restored the flies’ induced arrhythmic circadian clocks, reduced the aggregation of diseased proteins in the brain and reduced the number of neurons killed by those proteins. In the next step, the researchers plan to test this method in a fruit fly model of Alzheimer’s disease. 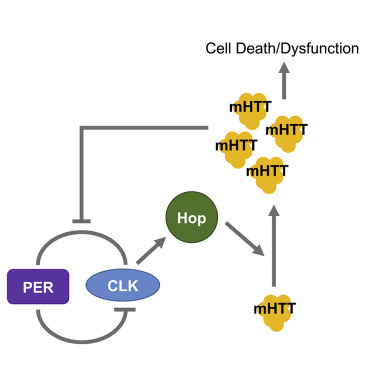 They believe that targeting and knocking down the hop gene could potentially be an early intervention for slowing the progression of various neurodegenerative diseases.